French designer Emile Gallè is considered to be one of the leading driving forces behind the Art Nouveau movement. His naturalistic designs incorporated with innovative techniques makes him one of the pioneering glass makers of the late 19th, early 20th century. Taking his inspiration from nature and plants along with a heavy Japanese feel it is no wonder the French have been known to describe his work as “poetry in glass” and across the globe collectors are willing to pay premium prices just to own an example of this talented iconic designers masterpieces. 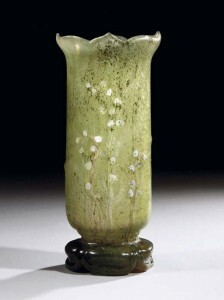 Pictured left: Emile Gallé – Aux Muguet Marqueterie-Sur-Verre Vase, Circa 1898-1900, glass, engraved and inlaid with three white lily-of-the-valley stems, with lobed foot inlaid with green and purple leaves – 10¾ in. (27 cm.) high -engraved Gallé. Sold for £72,000 ($135,504) at Christies, London, October 2006. Born in the Eastern French town of Nancy, in 1846 Emile Gallè was almost destined to become a glassmaker as his father, Charles Gallè was already a successful faience and tradition glassmaker with his own factory. After studying botany, philosophy and art he later went on to learn the technique of glassmaking at Meisenthal before joining his father at the factory in 1867. 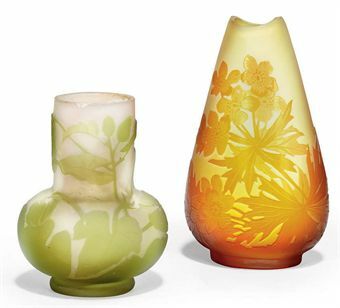 Pictured right: Two Small Cameo Glass Vases By Emile Gallé (1846-1904) Circa 1900 glass, overlaid and acid-etched, the yellow and red vase with cameo mark Gallé, the other vase with cameo mark Gallé. Sold for £875 ($1,367) at Christies, London 2010. Gallè also travelled extensively around Europe developing his knowledge of glassmaking by visiting museums and studying the work of other influencial designers. He was introduced to techniques such as enamelling which he discovered in the Oriental collection at the Victoria and Albert museum in London and was fascinated by the cameo works of great designers such as Eugene Rousseau. On his return to Nancy he started to experiment with his new found knowledge with his early work mainly being clear glass decorated with enamels but it was when he replaced his father as director of the factory in 1877 that he took his work to another level. He revolutionised the art of glass making by combining ancient techniques such as enamelling, cameo and inlay with his own influences. Combining heavy opaque etched glass with Japanese styles, he also added an air of mysteriousness by carving or sealing a poetic sentence within each vessel. This imaginative and innovative feature was soon to become the trademark of his work. Gallè’s work really became well-known after being so well received at the Paris Exhibition of 1878, where he was awarded a “grand prix”. However Gallè wasn’t happy as he felt the exhibition did not look to the future, so in 1894 built his own manufacturing plant in Nancy and began to create his own designs. He employed a team of designers and craftsmen who together worked on his designs and each only applied his signature on Gallè‘s approval. He continued to exhibit and gradually his fresh, new Art Nouveau styles began to win him International awards. The factory now had 300 employees and demand for Gallè’s work was high. So they started to mass produce using industrial techniques. However Gallè’s hunger for discovering new designs ensured that he continued to experiment with glassmaking possibilities. He discovered metallic foils could give a desired effect when applied into the glass making process especially when incorporated into the cameo work. This process is often seen in his work, by applying the metallic foils between the coloured glass sheets, the end result is a highlighted effect to the finished detail. His enamel work was just as revolutionary as he mixed metallic oxides with glass and suspended in oil giving a very different finish after firing to the way other glassmakers made use of this traditional technique. Every piece created by his hands was always heavily influenced by his passion of naturalistic designs. The effects almost bought his subject matter to life and they jump out at you as if they are truly growing around the vessel. The plant life that adorns his pieces are varied and incorporate everything from the thistle to fuschias and clematis to chrysanthemums. However, aside from flowers and plants he also used insects often as a subject matter. Many of his pieces can be found with butterflies and dragonflies and some even depict insects such as beetles. Another favoured decoration was that of landscapes and again Gallè looked to his own surroundings for inspiration with these detailed designs. He applied these decorative subjects mainly on vases but also created some stunning table lamps, some of which were wheel-carved, a process of cutting into facets aided by a rotating wheel. This technique was originally used and developed in 8th century BC but not perfected until much later in the 18th century. Determined to make his new style known worldwide he decided to set up his own grouping of artists and industrialist in 1901. Known as the “Ecole de Nancy” this team would become part of building the new fresh Art Nouveau style with the objective of carrying this movement forward, sealing the union between art and industry. The designers also drew their inspiration from nature but in particularly the area that surrounded them in Lorraine, France and this was transferred not only onto glassworks but also furniture and ceramics. Sadly just four years later in 1904, Emile Gallè died from Lukemia. The “Ecole de Nancy” continued to run until 1909 and his widow operated the glassworks together with another leading light of the Art Nouveau, furniture designer Victor Prouvè . All of the glass being made continued to bear Emile Gallè’s signature although a star was engraved alongside to indicate the pieces were produced after his death. Production then ceased with the outbreak of World War I in 1914 and was not started again until after the war when Paul Perdrizet, Emile’s son-in-law took over the factory. Paul’s contribution was to add new designs although these were still very much in the same technique and style that Gallè had used throughout his lifetime. Finally Production ceased altogether in 1936 and no more authentic Gallè works have been created since, although many have tried to copy and recreate this great artist’s work but none have ever succeeded successfully.